A surplus of inventory can hurt your business, especially if you have had a difficult time selling your merchandise. Perhaps your demand forecasts didn’t play out as expected, or consumer trends have suddenly shifted and fewer people are interested in your product. Whatever the case, getting rid of excess stock is key to maximizing profits and eliminating waste. By paying close attention to your inventory data, you’ll be in a better position to make purchasing and marketing decisions. If you need to get rid of surplus inventory, for any reason, there are many ways to go about it. Here are some tips to make the process as smooth and efficient as possible. By freshening up your merchandise, you may be able to sell off excess inventory and recoup most of your investment. Keep in mind that marketing your goods may require you to dish out some money, so be smart when implementing new strategies. If you have an item you believe could be a good seller, the marketing investment may be well worth it. If your marketing efforts aren’t successful, offer excess inventory items at a discount. It’s best for retailers to discount prices in increments. Start off with something small like 20% off, and then work your way up from there. You can also kick this tactic up a notch by creating a sales event. A flash sale can give consumers a sense of urgency, encouraging them to purchase your inventory at exceptional prices. Big sales events can also attract huge crowds, which may help entice customers. Sales will not only help you liquidate excess stock but can also help grow your business by attracting new customers too. 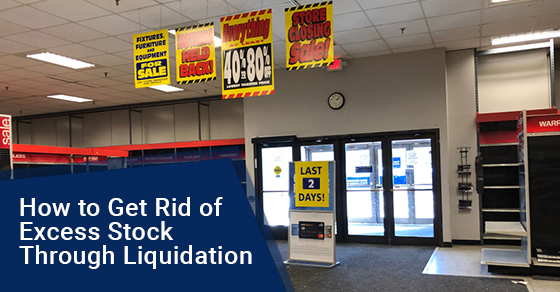 Whether you’re going out of business or trying to make backroom space, a professional liquidation company can help you recover your monetary investment. They will not only organizehttps://www.michaelsglobaltrading.com/liquidations/business-asset-liquidation/ liquidation sales and auctions on your behalf, but also market your goods to the right audience, implementing strategic discounting tactics to help you gain maximum dollar for your assets. This is a good strategy for low-cost items that aren’t worth further investment. If you have a product that’s difficult to sell, consider offering them to customers as freebies. For example, you can hand them out to clients who spend $50 or more. You could also offer these items as an incentive to sign up for your mailing list, or include them in ‘swag bags’ on customer appreciation days. By doing this, you’re promoting your business and growing your customer base; it’s like using the cost of your excess inventory as a marketing expense. Another option is to donate your surplus inventory to a local community group or charity. Many schools, churches, or homeless shelters are happy to take free, unused merchandise to help people in need. Check your government’s tax laws to see if there are any tax deductions available for charitable donations. It’s not, however, just about getting a tax break. Donating inventory is a good PR boost, and will show customers you are serious about taking care of the community. As you can see, there’s no reason for surplus merchandise to create added stress. There are many ways to get rid of excess goods. And if executed properly, there are opportunities to open up sales, attract new clients, and initiate customer engagement in the process. However, there’s no need to feel as though you must embark on this journey alone. Hire the services of a professional liquidation firm to handle the details for you, so you can focus on other areas of your business. For more information on getting rid of excess stock, call Michaels Global Trading at 1-888-471-5066 or contact us here.